Globally sourced lifestyle furniture supplier Porter Designs recently announced their debut at High Point Market featuring a modern mix of unique and affordable quality furniture. 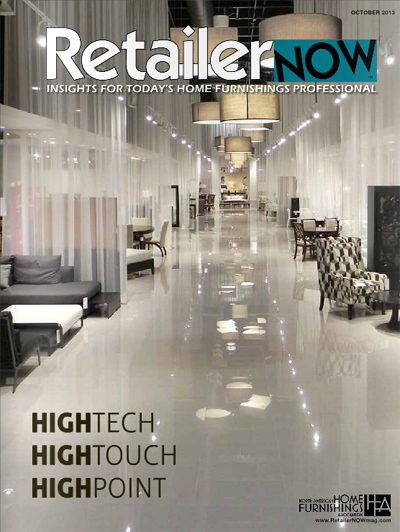 The company’s new 15,000 square foot showroom is located in Centers of High Point – Centennial #119. Porter Designs has several new items including cocktail tables, nesting tables and a wine barrel made with solid mango. Offering finishes such as honey oak and chestnut that complement the wood grains, these also feature metal accents such as a metal foot rest seen on the Willamette Valley wine barrel bar. A separate bookshelf that is being added to the Urban collection is made with solid sheesham and features six asymmetrically stacked wood boxes, allowing the piece to be used for storage and/or as a room divider. 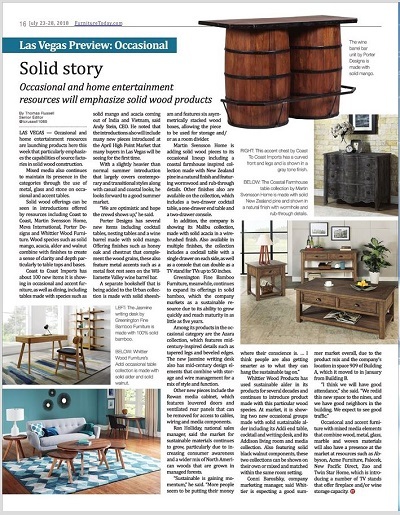 In the October, 2013 Issue of "Retailer Now", Marty Cramer of Cramer's Home Furnishings mentions the D800 "Brookside" Dining set as a "Whats Selling Now" item.